He’s a deer I’d been searching for over two days. Driving through the rugged badlands of the Tongue River Country of northwest Texas, mule deer are numerous but the big ones are rare. On the flat fields where canyon draws feed to and from the area’s agricultural grounds, mule deer often congregate by the dozens to feed on fresh green shoots of tender wheat. Their pattern is predictable: they travel and bed in the rugged breaks and crags that were created by incessant forces of wind and water, and when it’s time to eat, they move out to the open areas where humans cultivate the land and provide an easy meal for a variety of wildlife. Mule deer are especially fond of this loosely symbiotic relationship. Their behavior seems at odds with the usual wariness that wild deer typically exhibit. Whitetails, the cousin of mule deer and the source of the ascendant DNA in which the mule deer evolved over millennia, are more paranoid and like to stick close to cover in order to flee if danger presents itself. Mule deer, on the other hand, evolved in the western United States and out on the open plains where they could see danger well in advance. Of the two primary Texas deer species mule deer are the more claustrophobic, preferring to stick to the wide open areas where danger is easily spotted. While the mule deer’s range is huge compared to the whitetail, winter and the mammal’s ultimate proximity to food sources make their pattern a little more predictable out here. So with two days left in the old year, I roamed this ranch in search of a post-rut buck, tapping into his likely travel corridors where he goes back and forth to feed and bed. The first morning I caught a glimpse of him bedded in a grassy draw just off the dirt trail that connects the ranch headquarters to a remote pasture, where cattle are grazed in what’s arguably the finest cattle country in the nation. His ivory-colored antler tips were raised just above the grass. I knew he wasn’t a whitetail because of the way his main beams dichotomously branched. Whitetails typically have a main beam in which each tine originates. The prototypical mule deer is a 10-pointer with a wide inside spread, smaller brow tines in relation to his overall antler size and a split main beam that sports two tines at the end of each branching section. The ranch road is a big loop and for two hours, I circled the buck and he never stood up. With the light flat and my patience thin, I made the 40-minute drive back home with plans to return the next day. The next morning, I drove through a cut that transitioned from the flat open ground on top to the river bottom below. That’s when I saw him. He was loafing down a ridge where he’d fed all night to the bedding area where I saw him the day before. He’d traversed topography that whitetails would avoid; mule deer are sure-footed denizens of the rough country, and he deftly walked the cuts and crags of the badlands. He was parallel to my truck when he saw me, but he was not alarmed as mule deer are comfortable with seeing danger from a distance. In the broken country in which they tread, if danger gets too close, they can stot away in a bounding retreat. This four-legged hop allows them to cover a massive amount of ground in a short burst and by jumping from all four legs, it’s a more stable way of traveling in scabrous terrain. So as he steadily made his way back to his bed, I photographed him off the ridge with a predawn blue sky contrasting him and the native vegetation around him. To me, it’s my most iconic photograph of the less common of the two species of Texas deer. The whitetail deer is the oldest deer species in the western hemisphere appearing in the fossil record as far back as 4 million years ago. In the book Mule Deer Country, Valerius Geist writes that there’s a great deal of evidence in the fossil record concerning the whitetail deer. Its biological success can be attributed to the fact that the whitetail has changed little since the earliest fossils were discovered. That means the species is very adaptable to wide variety of biomes. And, through the ages, the deer expanded across the continent. As the whitetail moved west, a separate species emerged: the black-tailed deer. After a million years species evolved along the west coast as a distinctly separate cousin to the original whitetail. According to Geist, the mule deer is a hybrid of the black-tail and the whitetail. Because mule deer share almost identical mitochondrial DNA as whitetails, it’s suspected that the original mule deer hybrid had a whitetail as a mother and a blacktail as its father. Therefore, scientists believe that the mule deer is relatively new to the biological landscape—the product of crossbreeding by an east coast deer and a west coast deer. As such, the mule deer has, in large part, been a biologically successful hybrid until the dawn of the 20th century. However, not all is currently going well for the animal. Historically, mule deer resided in nearly every Texas county west of the 100th meridian. By the middle part of the 20th century, over-hunting and habitat mismanagement reduced their range substantially and pushed them into the desert mountains of western Texas and tiny pockets in the Panhandle. Currently, due to a trap and translocate program that ended in 1988 and stricter adherence to sound habitat and population management philosophies, their numbers and range have expanded from the low point of the 20th century. In body size, mule deer are slightly larger than whitetails and the first thing you’ll probably notice are its large namesake ears that resemble those of a mule. A main physical characteristic that makes mule deer easy to spot is the white rump with a black-tipped tail. Whitetails generally prefer wetter and vegetatively dense habitats found in the eastern two-thirds of Texas. Mule deer prefer dry, open country and range over as much as 10 times more area than whitetails and their diet varies as well. Because of the inherent differences in whitetail and mule deer, management strategies vary between the two species. “The mule deer is the only big game species in decline in North America,” said Charlie Stockstill, regional director of the Mule Deer Foundation, a Utah-based conservation organization whose purpose is to ensure the conservation of mule deer, black-tailed deer and their habitat. With funding help from the Mule Deer Foundation, the Texas Parks and Wildlife Department (TPWD) is trying to determine why, of all places that mule deer are found, the Panhandle herd is actually showing signs of expansion. “It’s really early in the study and we don’t have any definitive answers, but agriculture does seem to help with the food problem that mule deer face,” said Dana Wright, a TPWD biologist and principal investor for a six-year study regarding the influence of agriculture on mule deer movement and survival in the Texas Panhandle. The study’s purpose is determining how agriculture and its presence in mule deer habitat in the Texas Panhandle impacts deer movement and survival. By monitoring radio-collared mule deer, researchers can determine movement distance, home range sizes, survival rates and habitat use. Using this information, along with information about crop growth and nutritional value of vegetation in the area, it’s hoped that researchers will learn more about how deer use crops and how that affects mule deer movement, productivity and survival. 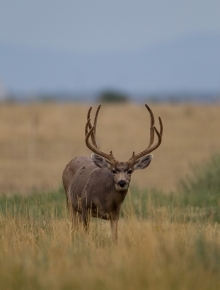 This information will ultimately help produce more accurate mule deer population surveys, provide appropriate deer harvest recommendations and develop effective habitat management strategies in agricultural/rangeland mosaic landscapes. While Wright said that they are only into year two of the study, so far they are uncovering some surprising issues regarding the mule deer. Wright said that in 2010, survey numbers showed mule deer at their highest level ever in the Panhandle. During the drought, however, that number sharply declined. Post-drought mule deer numbers seem to be back on the increase and Wright thinks that the mule deer’s proximity to winter grown agricultural crops may have some benefit. The increase in usable forage helps the mule deer make it through cold Panhandle winters. As Wright and her team of researchers study some of the vexing problems that mule deer face, brush encroachment and their slow biological clock are working against mule deer success in the Panhandle and Rolling Plains. As the team studies the preliminary data, it does seem that the presence of agriculture affects the deer’s travel patterns. GPS collared-mule deer show researchers that bucks’ seasonal movement patterns take on a dumbbell shape that’s scattered over a five square mile area. In essence, they have a large spring and summer habitat and a large fall and winter habitat that favors cultivated farmland. Each of these broad, circular areas are connected by a narrower travel corridor in which the mule deer bucks concentrate their movement. In the end, Wright concludes, there are still a lot of mysteries in regards to how mule deer utilize their habitat, and this early in the project, they are still unsure of how deer seek out and utilizes food and cover sources to their benefit. What the future holds for Texas’ other deer is a guess. As conservation groups and scientists look to unlock the secrets of what makes the species thrive, there is optimism in people like Charlie Stockstill. He sees that informing the public about the mule deer’s plight is a big step in reversing the species range wide decline. To that extent, he enjoys being on the front lines of the effort. “Solving the mule deer problem is not a quick fix but we are doing our part and trying our best to help interested parties,” said Stockstill. Learn more about TWA in our video, “Who We Are” below.